NASA must have thought through the timing of their latest announcement. Only one day after the final Atlantis landing, the space agency revealed the exact details of their next major mission. Later this year, a rocket will launch and carry a rover named Curiosity to the massive Gale Crater on Mars. They picked that location--and presumably the name of the rover--for a very intriguing reason. 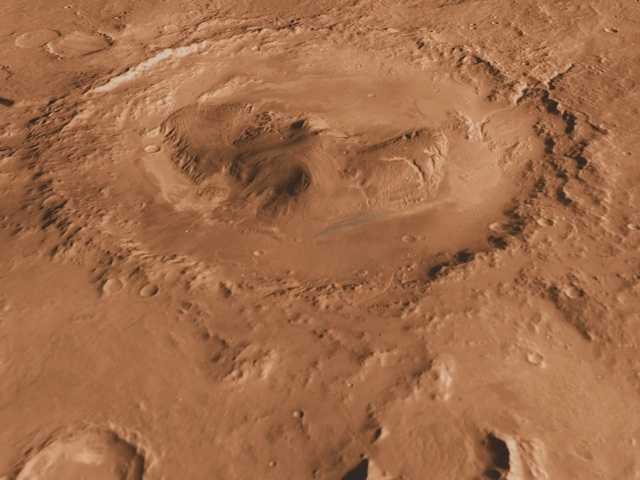 Scientists think that if it existed anywhere on Mars, life existed at Gale Crater. "We believe that at Gale Crater, we have located that boundary where life may have sprung up and where it may have been extinguished," said Brown University planetary geologist John “Jack” Mustard. "That’s why were going there." The 96-mile wide crater is about the size of Connecticut and Rhode Island combined. Located just south of the Martian equator, it's home to a number of geological features that researchers believe were caused by liquid water on the surface. There's also a Grand Canyon size crater bisecting the crater that scientists believe was made by running water. In the middle of Gale Crater is a mountain taller than Mount Ranier that will contain millenia of Martian natural history within its sediments. Curiosity, the centerpiece of NASA's $2.5 billion Mars Science Laboratory (MSL), is equipped a mechanical arm for scooping up soil samples, 17 cameras and ten other instruments that can sniff out other clues about what happened to the water on Mars, an investigation that will help them understand whether Mars once supported life. Now, we really wanted to name this blog post "Spaceship Heading to Mars to Look for Aliens," but NASA insists that it's a little too aggressive to say they're looking for Martians. "Let me emphasize that we are not a life-detection mission," said John Grotzinger, an MSL project scientist at Caltech on Friday. "We cannot look for fossils, microbial fossils, of any type." The signs of life they hope to find isn't life itself, but rather the conditions in which life may have been possible. In addition to water, scientists hope to discover certain clays, carbon compounds and water-descedant sulfates, which need water to form. Of course, this is all assuming that the rover doesn't crash into the side of the mountain, which is evidently a strong possibility.